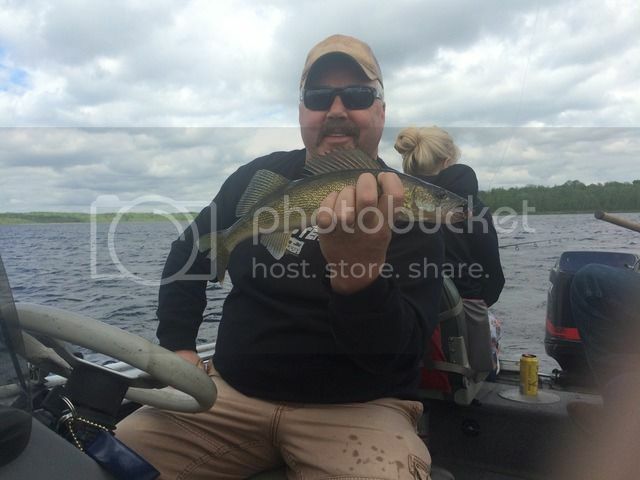 Big Sandy Lake Memorial report 2016 - - - 6 messages. Showing 1 through 6.
. The McGregor area was packed full of people from Friday night till Monday. As a matter of fact the traffic was light enough on Monday that I think most were staying the week. The recreational boats are back on the water and the sand bars are in full swing. Would like to do a quick shout out to the area resorts making people happy on the lake! Be patient at these establishments as many of them have some new owners and new employees. As many of you already know I have a seasonal camper at Eagle Point resort and have been there for a better part of 15 years. I was down at the bar and enjoyed their version of a Juicy Lucy. Highly recommended! I also went over to a very busy Zorbaz for a quick beer and Nachos. My son made it over on Monday to Big Sandy lodge for breakfast and was not disappointed. Hillcrest is on this weekends plans! On to the fishing report! I can tell you the sunfish are back to their usual beds and the crappies are on the spawn. As a reminder I want to make sure that you are respecting everyones fish on the area lakes. The limit on Big Sandy is (5) sunfish and I cant wait for them to make the crappies (5). If you see someone breaking the rules turn them in. Take some 8-9 inchers for the pan and have fun with catching. These fish are a beautiful resource that I would like to keep around for my children and yours. I want to bring up a great way to keep the kids busy. Take them pike fishing with plastics! Yes, you might lose a few lead heads and tails but the reward is so worth it. I had the opportunity to take my wife, son, sons girlfriend and daughter out for a running with the pike. I should have bulked up the line and leaders but there is walleye in this lake. I took my chance and stuck with the 6lb test and 1/4oz lead heads matched with some plastic ring grubs and pulsars. I dialed in the new helix 9 at about 1.3mph and headed for the sun. 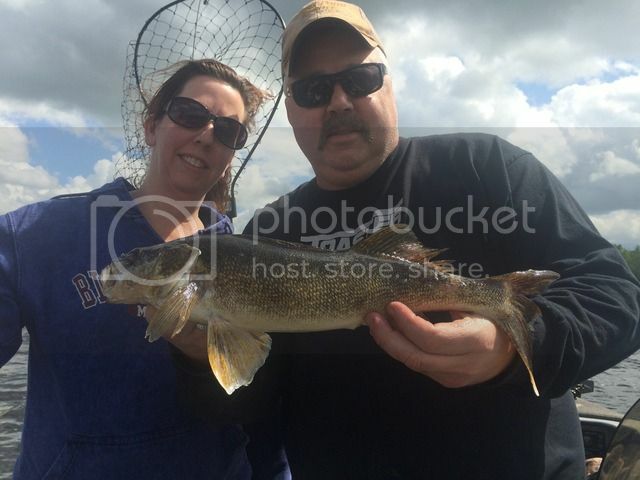 We easily landed 30-40 small pike with a handful of walleyes. 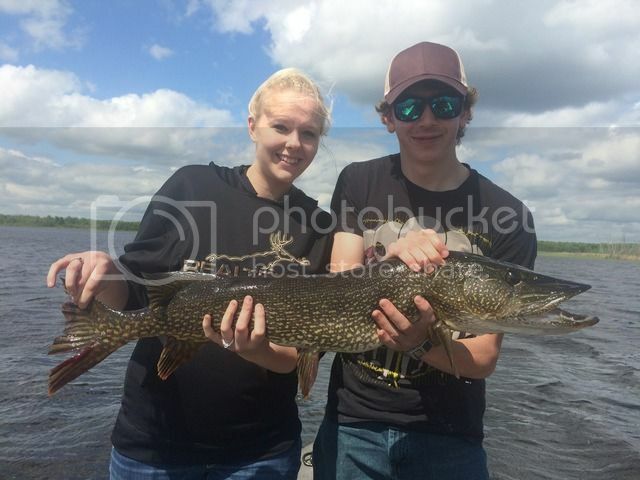 We had one surprise monster 36 pike that gave Taylor a run for the money! The bite for us was still pretty shallow, 4-10 fow, leeches on a plain or colored hook under slip bobbers was the best presentation for us. nice report Burr, I echo your comments regarding Eagle Point, we stopped there on Sunday, first time under new ownership, tried a juicy lucy. Their food was good, menu is a little limited now, I hope it expands soon. Walleye fishing has been slow for me, others are reporting better luck. I've been getting some hits in 10-15 FOW with minnows, my hook set has been a liability. In the spirit of the proposed DNR regs to thin out the population of small pike (why does it take so long to get the new regs established? ), I've started harvesting more of these hammer handles (in addition to any rough fish I get) for my huskies to eat. I'm heading to BSL tomorrow, staying at the campground on the northwest corner of the lake. Are there any pointers for going after walleye this time of year - fishing depths/presentations that work best right now? It is looking like it will be a little windy this weekend, so I will be staying on the west side of the lake tucking between the islands to fish as I only have a 16' boat. Any areas on the west side I should consider looking at? Last time I was up there (few years ago) I also went to Aitkin Lake to try to find some of those big sunnies everyone talks about, but was unable to find any monsters in the couple hours I was there. Any areas of the lake worth going to or avoiding to try to better pinpoint them? The Labor Day weekend had a good bite going. Pulling spinners with crawlers seemed to be the best presentation. Color didn't seem to matter. The area you are targeting is full of lots of structure. Most of it is holding some fish. Keep moving and you should find some active fish. Edges and saddles were working for me. 9-15 fow. Aikin is always finicky it seems for me. Sometimes good, usually tough. But you have to roll the dice to get into the big ones up there. We got one nice one. Neighbors found the crappies up there. Good luck! Thank you for the pointers Saddle Dave. I'll let you know how I do when I return from my trip.